If you were to ask me who my favourite cookbook writer is, I would probably say Maggie Beer. Maggie Beer has been a significant contributor to the creation of an uniquely Australian style of cuisine. I can still remember the first time I heard quince paste mentioned. It was 1999 and I was listening to Radio National. The presenter reported that the journalist, Richard Carleton, had been sent to East Timor to report on the war and requested he be provided certain foods. On his list was quince paste. The presenter had never heard of quince paste and asked his audience to ring in and explain it to him. Before long, it was established that it was a Mediterranean delicacy to be eaten as a sweet meat with coffee or with cheese and that Maggie Beer, from the Barossa Valley, made it. Today, everyone in Australia has heard of Maggie Beer’s quince paste and a multitude of other other fruit pastes, verjuice, vino cotto, capers, freekah, cumquats, preserved lemon, extra virgin olive oil, etc. These are the staple ingredients used by Maggie Beer and now part of mainstream Australian cuisine. Maggie Beer and her husband bought a vineyard and moved to the Barossa as a young couple. Not long afterwards, they established a pheasant farm. Maggie Beer’s first retail venture was selling pickled quail eggs at the weekend market. She decided to open Pheasant Farm Restaurant to create a market for the pheasants they were producing. Maggie Beer embraced the Barossa, its climate and its food culture. She is a champion of the Barossa Valley and all that is grown and produced there. She used it to help create an identifiable cuisine which Australia can call its own. She forged an awareness of the importance of using food that grows in the region in which you live, rather than using ingredients from half way around the world. I do love her books, especially her earlier ones. I also find them a little annoying, especially when she stipulates “…Barossa Valley corn-fed, free-range, blah blah chicken… or milk-fed lamb”. She can be a wee bit pretentious at times. Even though I have not cooked many recipes from her books, several of those I have cooked have become real favourites, namely: buttermilk panna cotta with cumquat sauce (my all-time favourite dessert) and chook legs with vino cotto. Other recipes I have featured on this blog are: green tomato chutney; chicken breast with rosemary, pinenuts and verjuice; almond and cumquat tart; and baked vanilla custard with coffee jelly. I must admit, you have to be prepared to cook a lot of her recipes. I wanted a recipe to make for dinner tonight without going into town to buy ingredients. I had trouble finding a recipe in her books that fitted that criterion. I was about to give up when I came across this recipe. It was supposed to be penne with rapini but, hey, rigatoni with broccoli is close. I have broccoli galore at the moment. The recipe won’t knock your socks off but if you are looking for something simple, light and/or vegetarian, it will do very nicely. I liked it more than Maus. Maus likes a sauce with her pasta but I am happy with a light coating. The recipe is from Maggie’s Table. I had trouble deciding which book to pitch for but, in the end, I am going with my favourite, Maggie’s Kitchen, the book she published with recipes featured on the TV series, The Cook and the Chef. Put the currants and verjuice (or wine) in a bowl and microwave on high for 30 seconds. Set aside. If using rapini, remove the leaves and discard the coarser stalks. Cut the remaining stalks into 5 cm lengths and roughly chop the greens and flowers. If using broccoli, separate the florets and slice into chunky pieces. Heat some olive oil in a frying pan and sauté the onion and garlic until soft and translucent. Add the rapini (broccoli) and cook until just tender. Drain the currants and then add them to the pan. Stir to distribute. In the mean time, cook the pasta. Add the cooked pasta to the pan and stir. Add a splash more olive oil to ensure pasta is nicely coated. Serve scattered with toasted almonds and shaved parmesan cheese. This entry was posted in Broccoli, Eating your bounty, Pasta and Rice, Something Simple, Vegetarian, What's for dinner? and tagged Maggie Beer by Glenda. Bookmark the permalink. I like pasta with a topping like this in the summer & especially love it with broccoli. I noticed that I’m not the only one who doesn’t know what a currant is – does it have a tangy flavor? Hi Diane. I am fascinated that currants aren’t common in the States. They are in every supermarket here. They are a small dried grape. Yes, they are quite tangy and sweet not dissimilar to the taste of dried cranberries. Beautiful recipe. Maggie is a living legend. Hi M, Thanks. A currant is a small dried fruit made from a small seedless variety of grape. 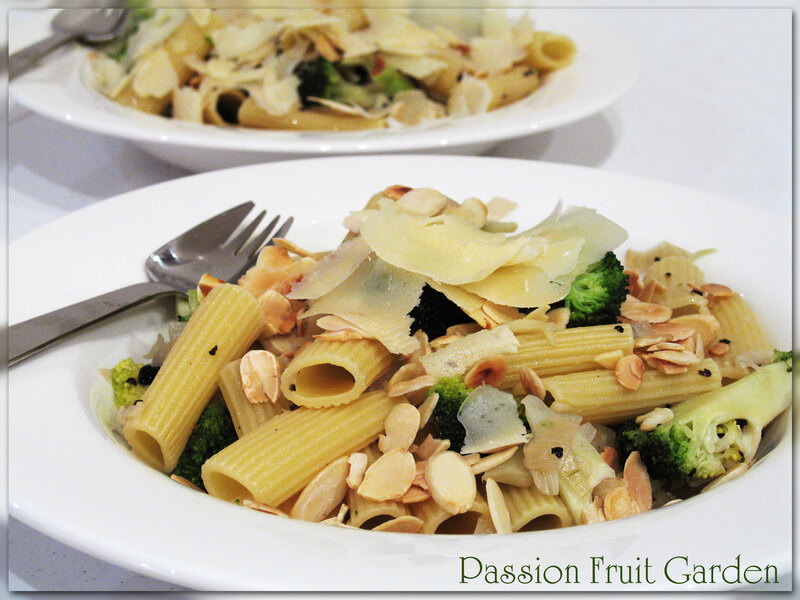 Another inspired contribution from Glenda at Passion Fruit Garden. I’d been eyeing off Maggie’s Verjuice cookbook for next year so this is a very welcome idea. Yum. Simple but interesting ingredients, flavors and textures work for me with pasta, although a sauce is ok too, but whole ingredients like this, make it feel more like a meal. I also am a fan of Maggie for her ideas, style and influence, although I am not, yet, a from a book cook. I live her books, TV shows, website etc. Hi Ella, I don’t think we can over estimate her influence on Australian cuisine.